This could be the best fantasy series if the other books are like this one. Best opening book to a series I have read in a long time. Sanderson is the master at structuring fantasy. A massive book that seems overload but overload it was not...fantastic magic system, charcters , storyline, plot, settings, etc...definitely not a boring book...can't wait to read the 2nd one. I read the Way of Kings, and Words of Radiance in 1 week. I could not put them down. The magic system is fantastic, the world is extremely strange, but extremely interesting, and there was not a moment when I thought the books should be shorter. why does this part talk more about Jordan's work than about the way of kings? This review seems like it describes more the Wheel of Time than the Stormlight Archive. Should be rewritten. Echoing last two comments that this isn't review of series. So far, the first two books down and they're incredible. Very good job in character structure and getting you involved in liking them. I'd rank this series up there with Martin's work or Rothfuss - no kidding. what is amazing about these books is that Sanderson creates a unique world with it's own flora, fauna and yes, amazing storm driven magic system. the scope of imagination is awe inspiring and it's amazing how fast you fall in love with the characters and their story (to the point you name video game heroes you play after them). my only complaint is the fact that I sometimes think the story goes too physically defying epic, but it's still awesome. Everyone does realize that Brandon Sanderson only finished "The Wheel Of Time" right. I don't know why most of the description is about a completely different author and book series. Content writing mistake? This ends as a review for WoT not WoK. I find it hard to fathom that this book series is on anyone's list, let alone listed at #3 of "best series ever". The Prelude and Prologue to the first book are very promising, but once you get into the book proper, it quickly becomes quite boring. While the author isn't quite as tedious with his descriptions of flora and fauna as Stephen Donaldson was in his Thomas Covenant books, he nevertheless wastes too much prose on these topics. Normally I literally devour good fantasy books, and can read a book a day, or every two days. It's a bad sign when I find myself skipping paragraphs by the time I get to Chapter 4 of a book. My advice to anyone considering picking up this series is to get it for free from your local library, read the first few chapters, then decide if it's something you like or not. Don't expect to be captivated though. 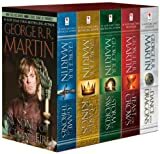 The top of the list of best epic fantasy contains really good series - Erikson, Martin, Tolkien, Abercrombie, Jordan, Abraham, Rothfuss (havent read Earthsea cycle and Lyonesse trilogy). The Way of Kings does NOT belong on 3rd place in my opinion, it should be FAR down the list. I am 2/3 through the second book, and i'm not sure I will even bother to finish. The character descriptions/development are below average, and the world itself is simply uninteresting and dull. Sanderson has tried to create a "fantastic" world different from our own, but it ends up feeling empty. And it's been 7 years and we only have two books. I hope you will all enjoy reading this series , if and when he finishes it. By the way he is publishing now, it will be in 27 years. Sanderson is an okay author...but he is going to burn out long before he gets this finished. Best to skip it. It is a great book. I cannot wait for the third book in the series. In the meantime I am trying to find something similar, without success yet.